Does anyone want to buy a bankrupt Las Vegas casino? Well, in the case of the Fontainebleau Las Vegas, the answer was an enthusiastic yes, as at least three real estate investors bidded on the property. Billionaire financier Carl Icahn cleared the table with a $156 million offer, leaving San Francisco-based real estate investor Luke Brugnara in the dust. With backing from a hedge fund, Brugnara actually bid higher, offering $170 million, but the examiner for the bankruptcy court ruled that he didn't get the paperwork filed in time.Brugnara had another disadvantage: he needed at least 30 days to arrange funding, while Icahn could simply shell out the cash. But losing the Fontainebleu isn't his biggest problem: he was indicted by a federal grand jury in April 2008 for allegedly filing false tax returns. According to the U.S. attorney in San Francisco, Brugnara failed to report more than $45 million in capital gains from the sale of multiple properties, including the former Silver City casino in Las Vegas. Last year he pleaded guilty to filing a false tax return in 2000 but then rescinded the plea and fired his attorney, according to court documents. Brugnara told the Las Vegas Sun the claims against him are false and he's "not worried" about the case. As for Icahn, the $156 million that he paid for the Fontainebleu is only the beginning. He also had to include $50 million for financing during the bankruptcy proceedings. Plus, Penn National Gaming, another of the failed bidders, estimated that it would take about $1.5 billion more to complete the casino. 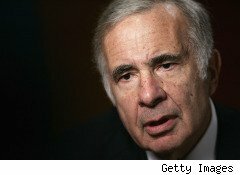 For the time being, Icahn is expected to mothball the project. He may complete the casino in the future or he may hold it and sell it when the market gets better. He certainly has the cash to sit on the Fontainebleu until Las Vegas's real estate market and economy turn around. At a January 27th hearing, the bankruptcy judge is expected to approve the sale, which must be closed by Feb. 9. Investors who backed Fontainebleau developer Jeffrey Soffer will lose most of the $2 billion already sunk into the project, which is about 70% complete.